Talk about your change of scenery! Last I wrote I was in the upper Midwest in Chamber Music Heaven -- now? I am in Milan, Italy and my temporary apartment is situated just above Via Montenapoleone, perhaps the most famous (and possibly dangerous) shopping street in the world: home to Gucci, Versace, D&G and all the rest! Honestly? It's not a place I would call very 'homey', but for the next 5 weeks, I'll have the challenge of making it just that! I've had quite a busy time since Minnesota, and in a way, it sums up what my life as an singer encompasses. I kicked off my marathon tour here in Europe with a challenging concert in Halle, the birthplace of Handel, and the host to a very vivid and busy Handel Festival each year. To sing some of Handel's great masterpieces in the Festival was indeed an honor. Among a mixture of arias and duets, it was my debut performing 'Ariodante' arias, singing "Dopo notte" and "Scherza infida" in public for the first time, and it was just enough of a taste to really excite me for when I will be able to perform the entire role on stage. It is quite a masterpiece! I must say, however, that this was a tough job. It seemed to be about everything else, rather than simply making music, and that is a tough position to be in when your goal is to move the audience emotionally through this music. Instead, it seemed to be about a lot of other things. (Side note: in defense of singers who sometimes make demanding requests: While I fully admit there needs always to be rationality and balance at play, often those demands are requested to keep the musician's mind on doing their job -- making music. I find that in instances where I need to do the jobs of other people, I arrive at the concert or performance with a great deal of difficulty trying to focus simply on the music at hand -- and this can be a great source of frustration.) This was one such experience. However, as they say, "the show must go on", and indeed it did, and in the end I think we did make beautiful music -- I just want you to know it's not always an easy path to forge! However, if you are anywhere near Germany, keep an eye out for it on your National Television, as we were filmed for broadcast! As soon as I hear of a broadcast date, I'll let you know! Then I repacked my 2 enormous suitcases and headed towards Milan, ready for the next adventure. 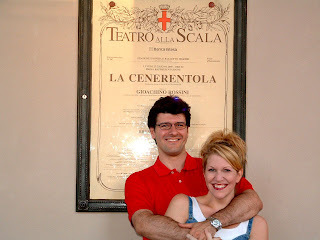 And it is La Scala, which naturally means adventures are waiting to be had! It is a theater which functions as no other I have ever witnessed. As is typical of this house, the second cast begins rehearsing (the first cast is generally allowed to show up quite late into the process), and we work very intensely and cohesively. The talk immediately turns to 'when are your performances? ', and of course, no one REALLY knows. La Scala has the rather exasperating practice of delaying the doling out of information to the artist, instead, choosing to hold their exact plan of action very close to the vest. Luckily, I discovered all of this on my first trip to this theater 4 years ago, and I find that I can take it a bit more in stride this time around; however, not being able to set your pacing in rehearsals for your opening creates an incredible challenge. For example, we, as the second cast, have no idea of how many orchestra rehearsals we will be given, if any, and if or when we might get stage rehearsal time; how in the world do you gauge yourself in the rehearsal room with only the piano, not knowing when your next run-thru of the piece will be? It just possibly could be 12 days from now in front of a packed house at perhaps the most famous opera house in the world! You just never know. The good thing to take from this, is that I approach each rehearsal now very seriously, singing nearly everything, and mentally preparing myself for my opening, whenever it may be. This kind of training, to my mind, is invaluable, as I attribute the majority of the success or failure of a given performance to one's mental preparation. I also treasure the collaborative time with my cast -- we are given the chance to really create a cohesive ensemble which will have a lot of chemistry come the opening night. Personally, I am not a fan of the 'add water and stir' approach to opera, and so I highly value this quiet time the seconda compagnia gets to slowly create our own version of Cenerentola! It is definitely a challenge to stay focused on the task at hand, and to keep from being pulled into the many machinations which are simply put, out of your control. It is a juggling act. While balancing on a very tight wire. Singing. That is why after a concert such as in Halle, and a first week of tough rehearsals, I will be thrilled to get in front of the audience again, and just make music. Even if it is on a high wire. While singing a lot of fast notes!